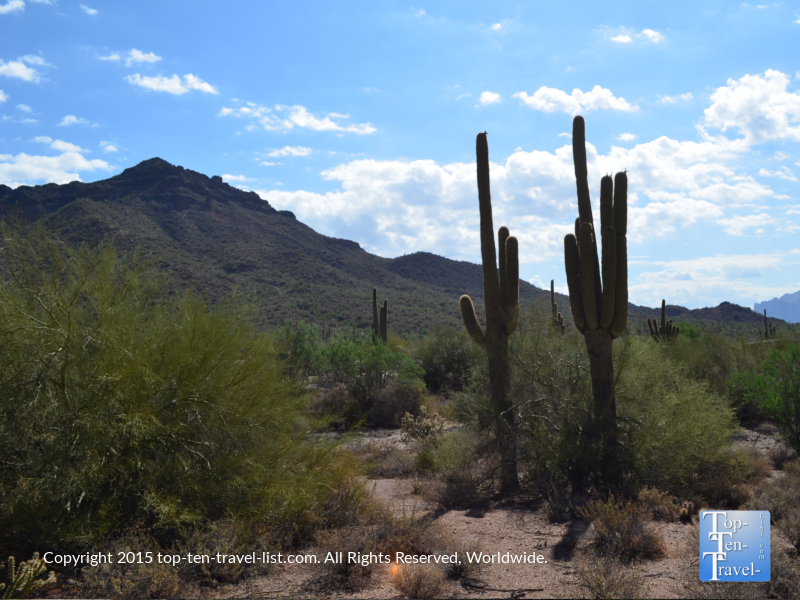 Usery Mountain Regional Park: Beautiful Cacti & Mountain Views in Mesa - Top Ten Travel Blog | Our experiences traveling throughout the US. 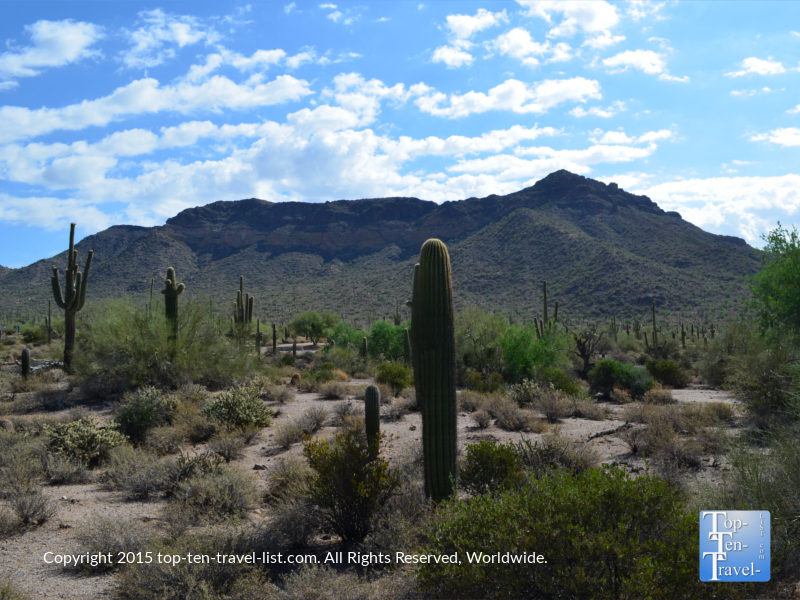 Usery Mountain is a gorgeous option for your scenic Phoenix hiking adventure. 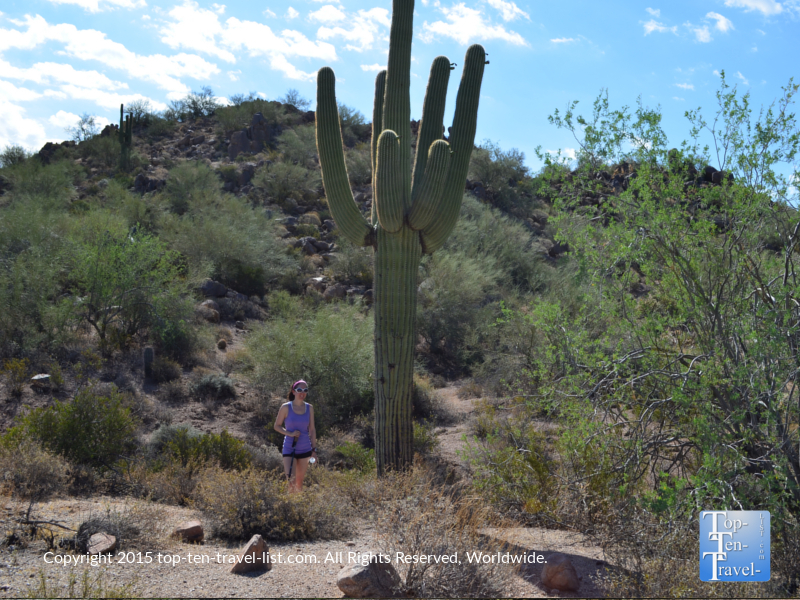 Whether you are looking to get in a light morning walk, an intense hill workout, or an all out cardio workout, you’ll find plenty of fantastic options at Usery Mountain. 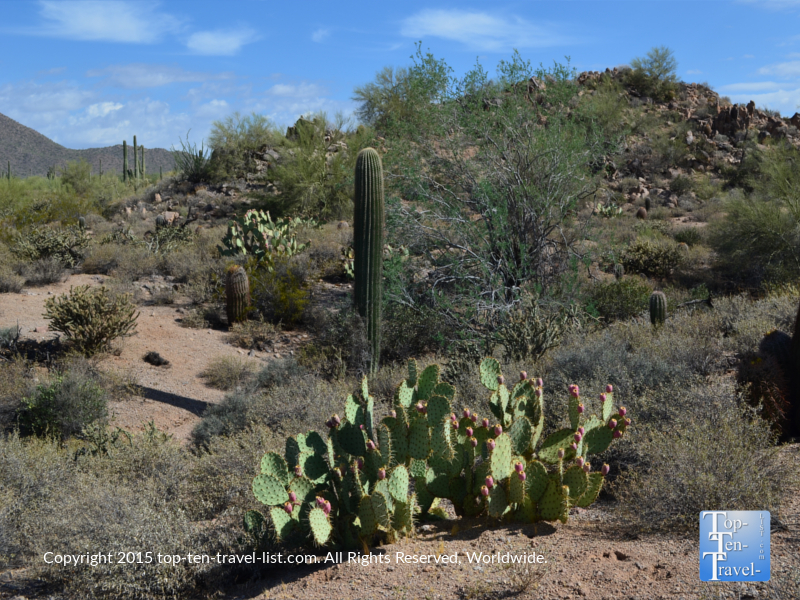 When traveling to the Phoenix metro area you have your choice amongst hundreds of miles of quality trails, although Usery Mountain in Mesa is a nice option as it is located within easy driving distance to the majority of the Phoenix metro area. The beautiful desert landscapes are spectacular enough to warrant the small $6 per car entry fee. 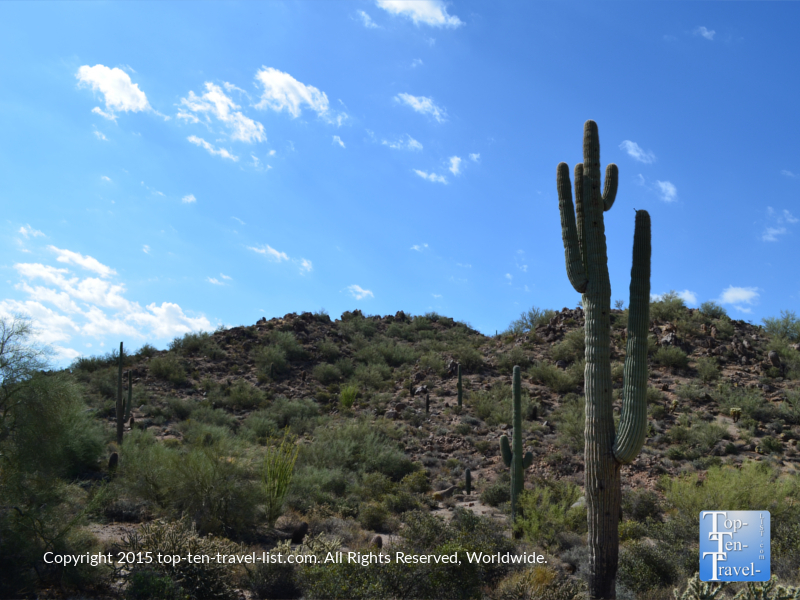 No matter which hiking trail you choose, you will get an up close view of the many varieties of cacti that make up the gorgeous Sonoran desert, including views of the Saguaro, which happens to be the largest in the world. 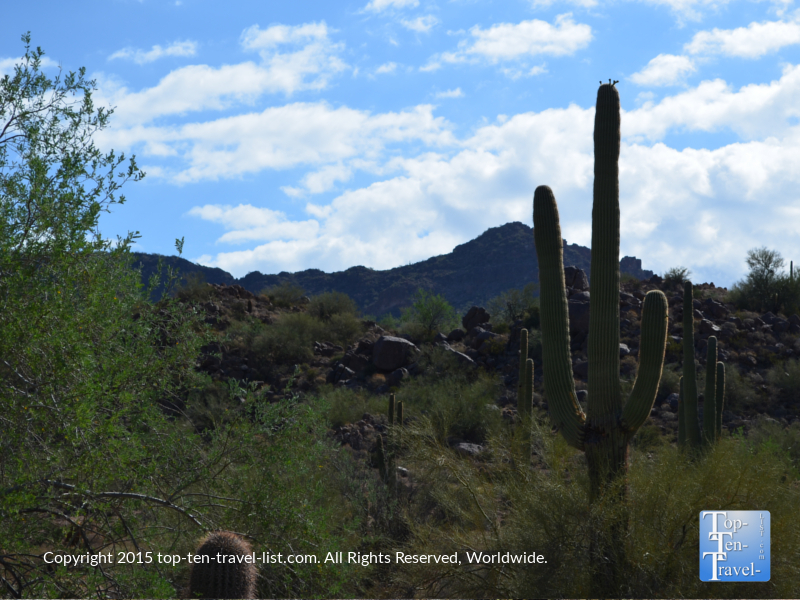 You will notice that there are no shortage of Saguaro cacti at Usery mountain. 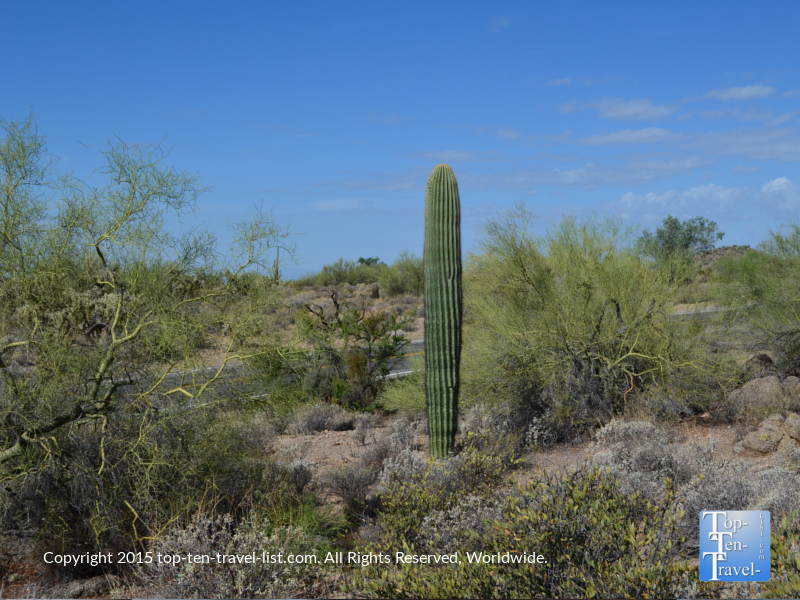 Pictured below is a side by side view of what it looks like to stand next to a Saguaro. Some of these incredible plants are 40-60 feet tall! 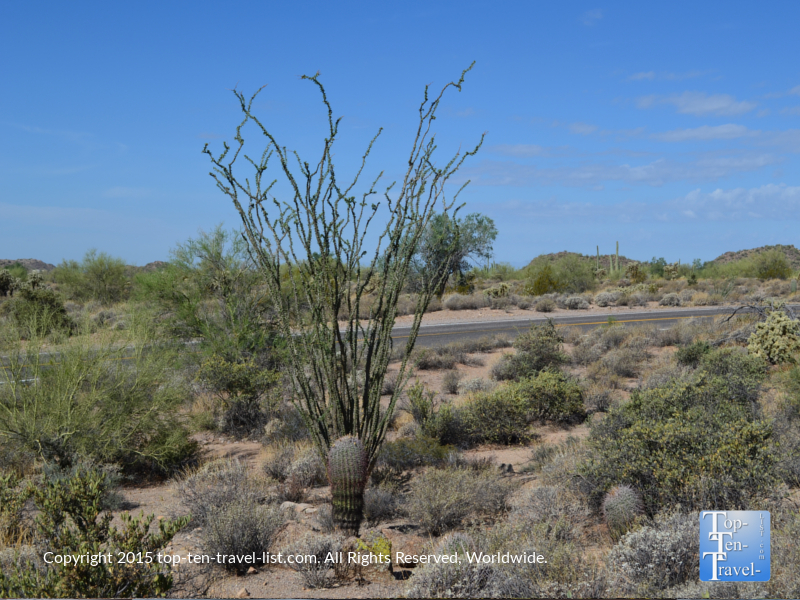 Also seen along the way are the Prickly Pear cactus and many other attractive species of cacti. 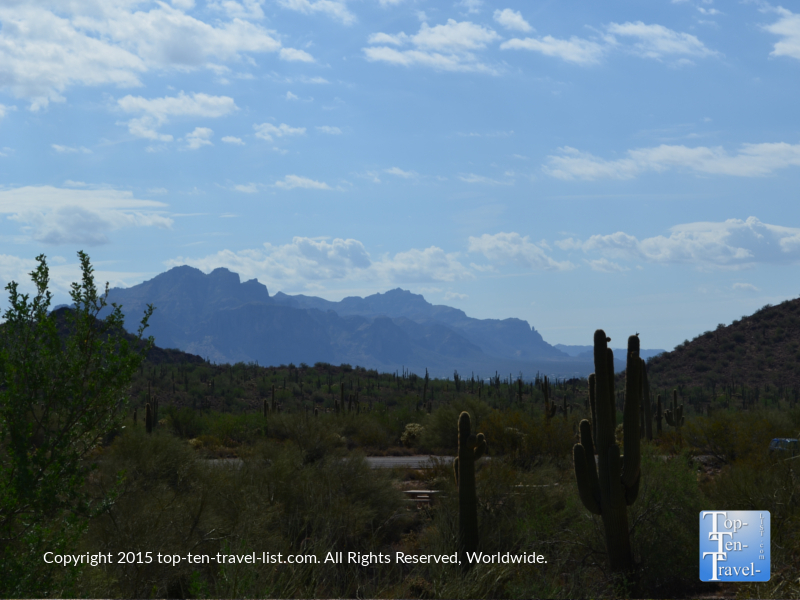 The mountain views are also terrific, especially those of the Phoenix mountain. Along the trails you will have many opportunities to take beautiful photos. 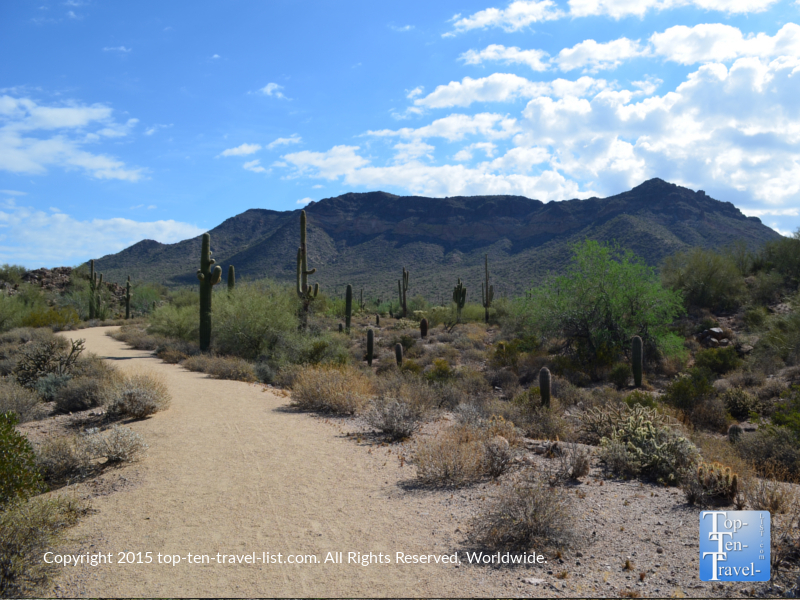 One particularly scenic trail with great views of both the mountains, in addition to numerous opportunities for cactus photography, is the Merkle trail, a short 0.9 mile loop which is perfect for those limited on time and/or wanting to complete a short summer hike before the intense afternoon heat rolls in. 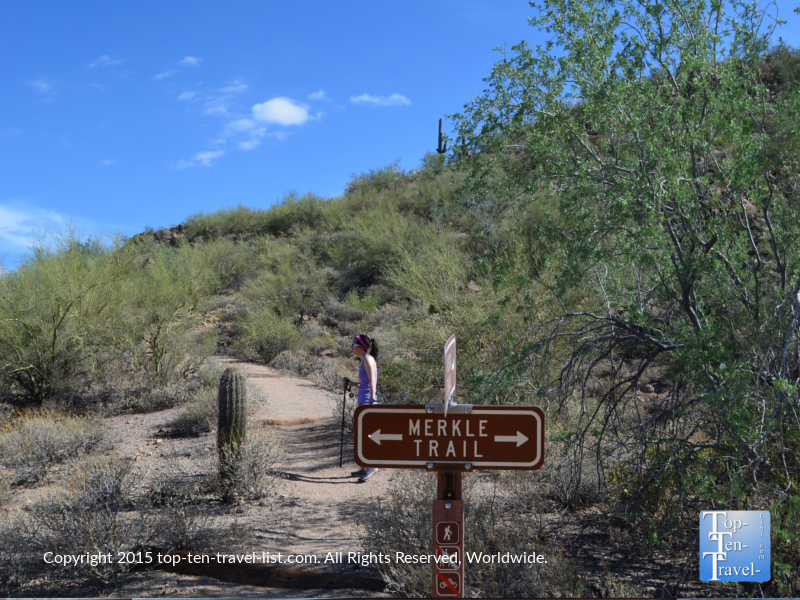 The Merkle Trail is short and flat, making it a perfect option for casual hikers and those looking to get in a small workout before the summer afternoon’s brutal 100+ degree temps hit. 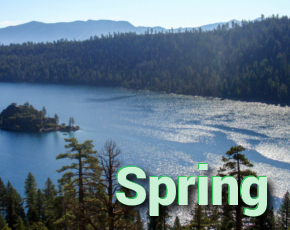 It should not take more than 30 minutes or so to complete this easy, yet very scenic, hike. 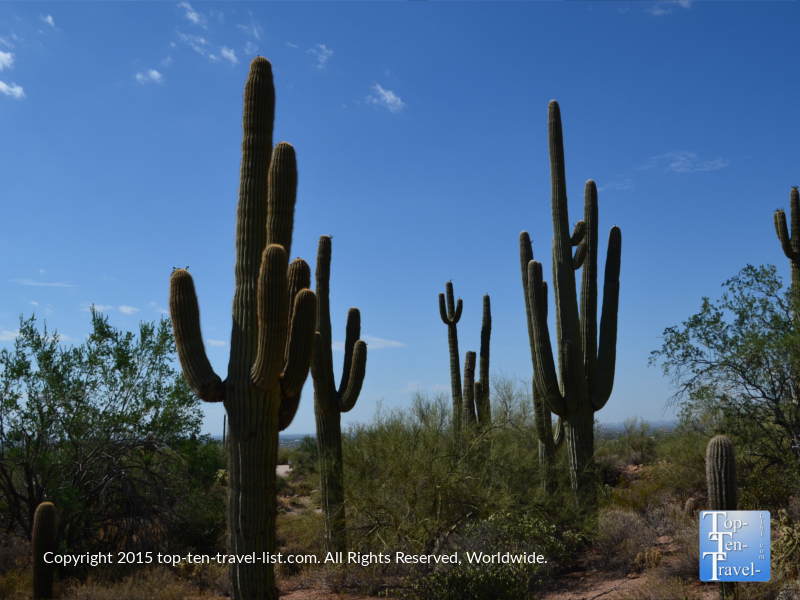 Be sure to stay on the trail as you can very easily get stung if you venture too close to the cactuses. Unfortunately, they can also blow over and stick to your shoes on a windy day. After having the very unpleasant experience of being stung by a cactus, I recommend dressing appropriately and not rubbing your feet against your legs just in case anything is stuck to your gym shoes. Getting stung by a cactus and having to pull the needles out leads to a pretty intense pain for much of the day – trust me! The picturesque desert scenery combined with the short distance & flat terrain make the Merkle trail the perfect choice for the hot summer season. 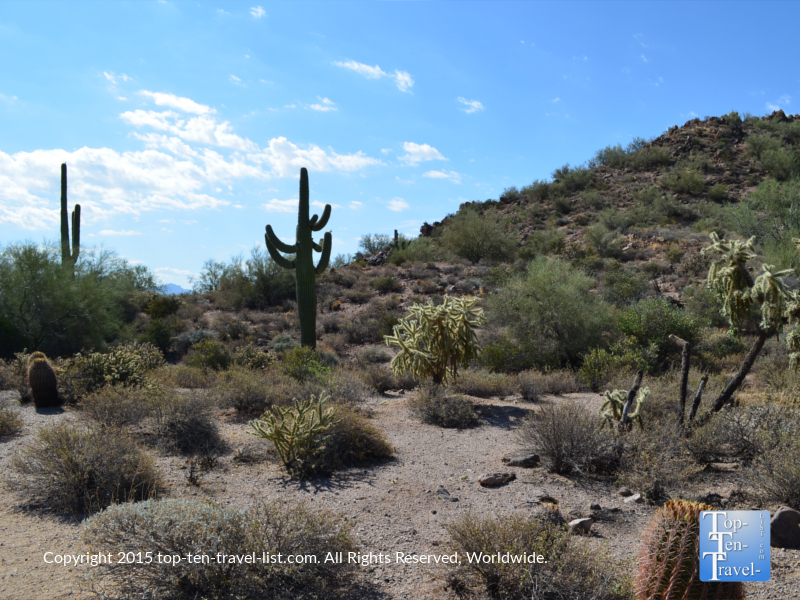 Aside from the amazing scenery, the Usery Mountain area is incredibly peaceful with absolutely no noise. 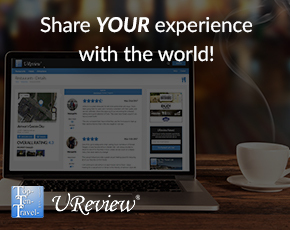 It’s quite a solitary experience for the nature enthusiast. You may see a handful of hikers during the early morning hours, but never enough that it feels busy. However, if you visit early enough you may just luck out and see some wildlife! 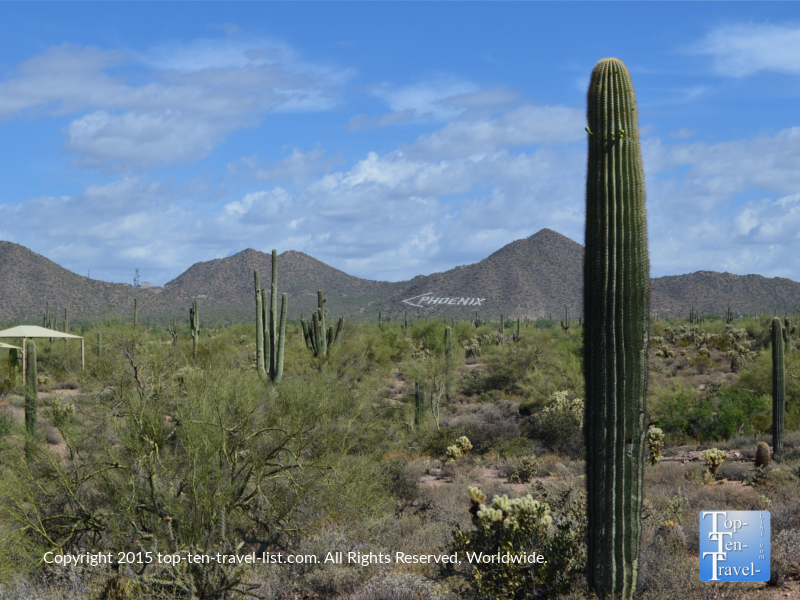 Take advantage of the quiet summer season and get out there early (5am-7am) for a beautiful hike through Arizona’s one and only Sonoran desert. 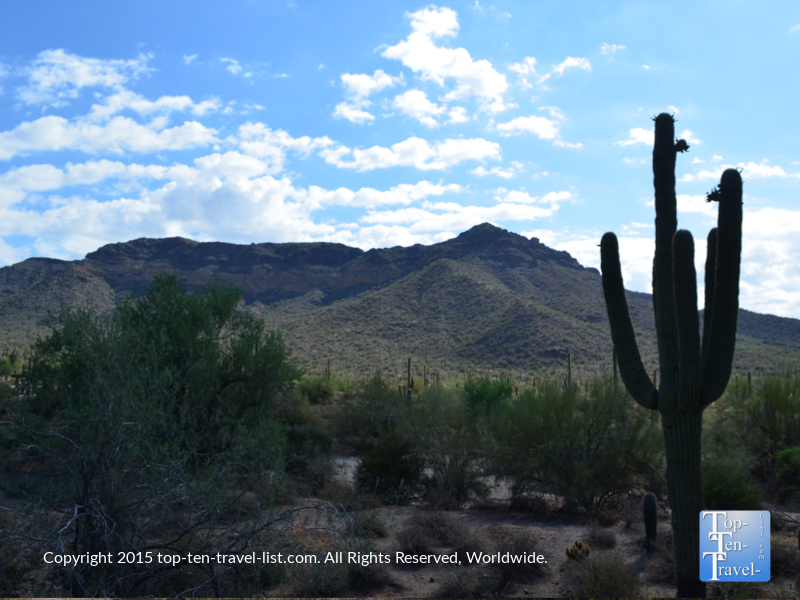 Enjoy the views and be sure to get your picture standing next to the amazing Saguaro cactus: the ultimate souvenir! 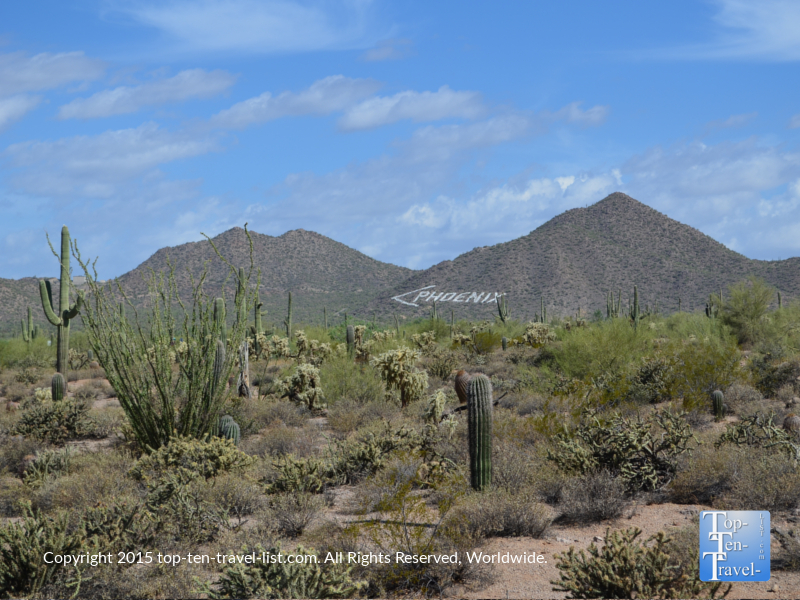 Usery Mountain is conveniently located in Mesa, an easy drive from anywhere in the Phoenix metro area. Be sure to keep the following tips in mind before venturing out on your hike. *Drink lots of water on any hike, even those that are short in distance. 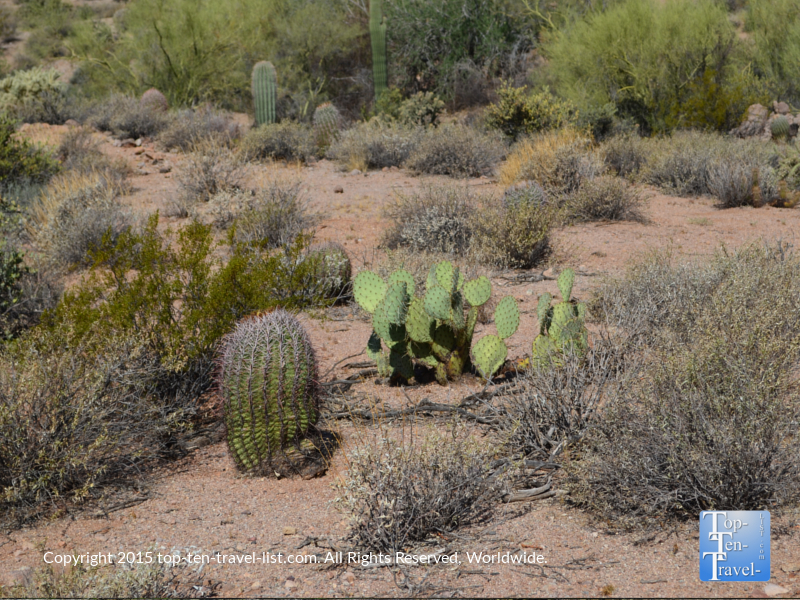 In Arizona’s extremely dry climate, you will need to drink much more water that you are accustomed to especially when engaging in any type of physical activity. Bring extra water bottles in a backpack or wear a camel bakpack to ensure you are staying properly hydrated. *Pick up a trail map at the Visitor’s center. Inside you will find a ranking guide for each trail including the difficulty level and total distance of the hike. *Pack snacks and extra water for longer hikes. *Wear proper footwear – gym shoes, not sandals. Even if it’s hot outside and sandals feel more comfortable, it’s much safer to wear gym shoes. *Plan a sunrise or sunset hike for the coolest temperatures and to increase your chances of seeing wildlife. As always, view wildlife from a safe distance and take caution with any snakes seen on the trail. 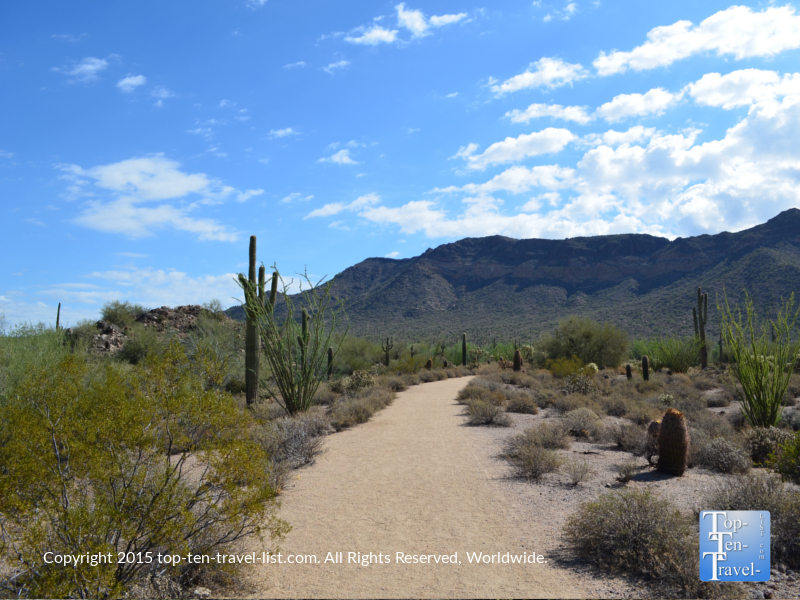 Have you ever hiked at Usery Mountain? 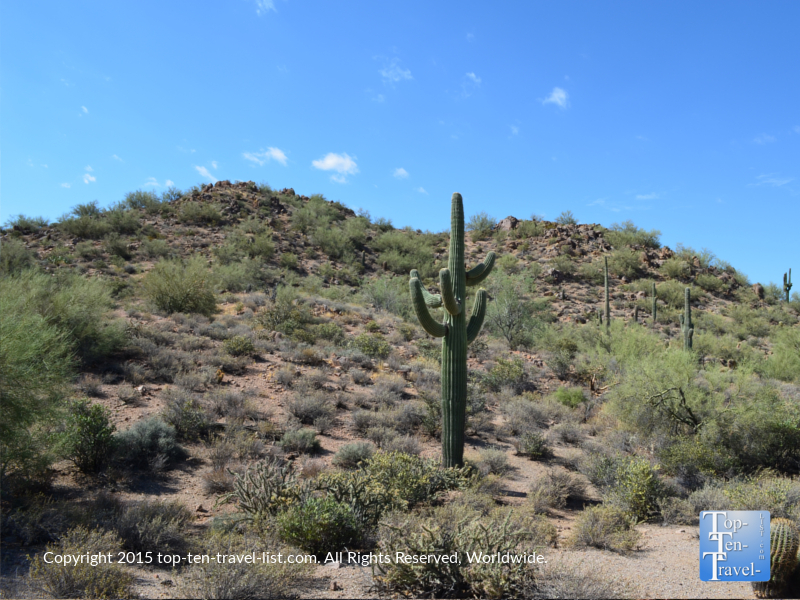 What are some of your favorite hikes in the Phoenix area?